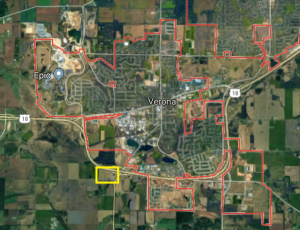 Jim writes “Over the past two years, Verona has gotten pitches for major developments to expand to the north, northwest, southeast and southwest. Monday, another pitch for a development in Verona’s Southwest Area – for a large-scale commercial center and an apartment development – is up for review. The 95 acres between Valley Road and the U.S. 18-151 bypass has been the property of SSM/Dean Health for more than a decade, and Verona’s addition of that area and land around it to its potential expansion area in 2012 was partly a result of Dean’s plan to build a clinic and complementary senior housing there someday. Read the rest of the “Developer Looks Southwest” article here.